Indian Motorcycle Company has a long history as one of America’s most esteemed and iconic motorcycle brands. Born in the late 1890s—the age of Mark Twain, the Klondike Gold Rush, and the Progressive Era—Indian quickly established itself as a symbol of modernization and American ingenuity. Now, the century-old brand is making a comeback—appealing to younger motorcycle enthusiasts while still remaining true to its American-made roots. In 1897, bicycle racer George M. Hendee created a bicycle production company, Hendee Manufacturing Company, which originally produced non-motorized bicycles. The brand name was changed to “Indian” in 1898, with the first Indian motorcycles sold to the public in 1902, after Oscar Hedstrom joined the company as a partner. The following year, Hedstrom broke the world speed record—reaching 56 mph—on an Indian motorcycle of his design. In 1906, the first cross-country trip on an Indian motorcycle was recorded; George Holden and Louis J. Mueller completed the trip from San Francisco to New York City in a record 31.5 days. (In 1903, the first cross-country trip in a Winton touring car—from San Francisco to New York City—had been completed in 63 days, 12 hours, and 30 minutes.) That same year, the first V-twin Indian factory race bike was manufactured. A modified version was available to consumers for the 1907 model year—and the 633cc V-twin was the first V-twin motorcycle engine to be mass produced in the United States. Indian continued to advance motorcycle design and function, including the development of leaf-spring front forks, 2-speed transmissions, automatic oil pumps, and the first electric start on a motorcycle, among other innovations. A record 32,000 units were sold in 1913. In 1914, Erwin Baker clocked a new record time for an East-to-West coast trip at 11 days, 12 hours, and 10 minutes. By 1917, the United States’ involvement in WWI had begun, and Indian Motorcycle began dedicating the majority of production to the war effort. Unsurprisingly, retail sales dropped dramatically, though the company provided almost 50,000 motorcycles (mainly from the Powerplus line) to the U.S. military between 1917-1919. Indian released several iconic motorcycle models in the early 1920s, including the first Indian Scout—which would become one of its best-sellers—followed by the Chief, Big Chief, Prince, and Ace. The 750cc V-twin engine was released in 1927, and would become one of the most iconic engines ever produced by Indian. From 1929 through 1939, the United States economy suffered through The Great Depression—one of the most impactful economic downturns in American history. The lowest point came in 1933, with nearly half of all banks in the U.S. failing—and retail sales dropped in almost every industry. However, innovations did not completely grind to a halt. Indian Motorcycle produced the model 203 Scout and Scout Pony in 1932, and the Sport Scout in 1934. In 1936, Indian introduced an exhaust over intake (EOI) design, and models that featured instrument panels atop the fuel tanks. The following year, Ed Kretz won the first Daytona 200 on a racing model Indian Sport Scout. 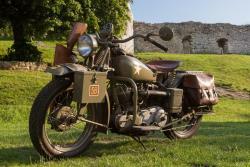 The early 1940s birthed WWII, and Indian Motorcycle Co. once again focused on the war effort—first by building units for the French government, and later producing the Model 841 for the United States Army. A new vertical twin 440cc Indian Scout model and vertical single 220cc Indian Arrow model were introduced in 1948 to increase competition with imports. Indian also developed a racing crew in the late 1940s, dubbed the “Wrecking Crew”, which was comprised of racers Bobby Hill, Bill Tuman, and Ernie Beckman. The Wrecking Crew went on to win three straight Springfield Mile titles, along with other major events across the United States. From 1955 through 1960, Brockhouse Engineering (which had acquired the rights to Indian) imported Royal Enfield motorcycles and re-branded them as Indians for sale in the United States. Imported models included the Indian Chief, Trailblazer, Apache, Tomahawk, Woodsman, Westerner, Hounds Arrow, Fire Arrow, and Lance. Burt Munro, a New Zealand native, set a new official land speed record in 1967—184.087 mph—on his modified 1920 Indian Scout Streamliner. One of his speed records stands to this day. A popular 2005 film titled The World’s Fastest Indian, starring Anthony Hopkins, was based on that event. From the early 1960s onward, the Indian brand name was passed through several corporate successors, with only a few successful models released. Following 1963, legendary motorcycle manufacturer Floyd Clymer attempted to reinvigorate Indian’s dwindling sales. After he passed away following a heart attack in 1970, his attorney, Alan Newman, maintained the Indian Motorcycle trademark and began selling motorcycles (mainly manufactured in Taiwan). Sales continued to decline, and operations ceased in 1977. 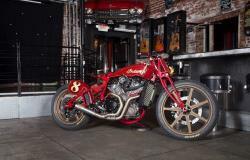 Production resumed in 1998, following a merger which formed the Indian Motorcycle Company of America (IMCA). The IMCA produced Chief, Scout, and Spirit models, but went bankrupt in 2003. In 2008, a London-based firm named Stellican Ltd. purchased the Indian trademark and began manufacturing in North Carolina. In 2011, Polaris Industries purchased Indian Motorcycles. 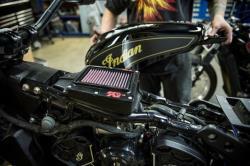 Following Polaris Industries’ purchase of Indian in 2011, Indian’s production facilities were moved to Spirit Lake, Iowa. In 2013, Indian began to sell newly-designed motorcycles, including models featuring a new 111 cubic-inch “Thunder Stroke” V-twin engine; since 2013, Polaris has expanded Indian’s line to ten models, with seven based on the Thunder Stroke engine (including the Chieftain—which Motorcycle.com would name the 2014 Cruiser of the Year—Chief Classic, and Chief Vintage). 2018 has seen continued growth for the brand, with sales increases in the low double digits despite an overall market decline in motorcycle sales. In 2016, an official return to professional flat track racing, paired with the introduction of the Indian Scout FTR750, reminded consumers of Indian’s long history as a manufacturer of cutting-edge technology—and Jared Mees’ victory at the 2017 American Flat Track Championship solidified that faith. Today, a combination of classic styling with solid, high-quality engine options helps Indian appeal to younger quality-conscious consumers—as well as decades-long enthusiasts who have remained loyal. 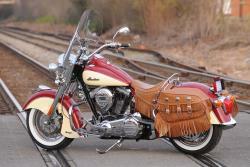 The Indian Chief Vintage. Photo credit to Indian Motorcycles. The 2019 Scout Bobber demonstrates the high engineering standards—and modest price point—that is making Indian increasingly popular. The 69 cubic inch engine provides an impressive 100-horsepower, with sleek design that pays homage to classic Indian style. For those looking for a bit more power, the Indian Chief Dark Horse features the now-famous Thunder Stroke 111 V-twin engine, offering a whopping 119 lb.-ft. of torque and aggressive, blacked-out styling. As motorcycle brands continue to explore methods of remaining relevant in difficult markets, Indian has found a strategy that works—delivering consumers quality engines, modern style, and engineering that translates from the track to the street. K&N has been a long-term partner of Roland Sands Designs, and also sponsors the Super Hooligan Championship Series—a dirt track series created by Roland Sands Designs that often features the best of specialty motorcycles, including Indians. “It’s a no-holds-barred battle to the stripe on 500 pounds of fury,” Sands says. 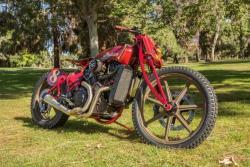 “With races across the country ranging from specialty bike shows and concerts to Pro American Flat Track events and beach-side racing, the diversity promises a unique experience at each event.” For the 2017 series, Indian Motorcycle offered a FTR750 Factory Indian Scout GNC-ready race bike as the championship prize. 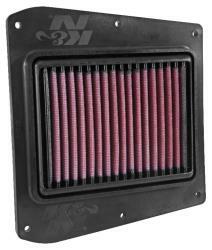 Explore the chart below to explore K&N part numbers for popular Indian makes and models. 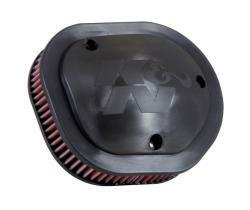 To find the most up-to-date information on product offerings, visit the vehicle search page.